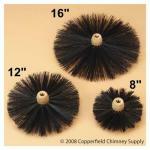 These brushes are made from a soft thin poly material and will bend when pushed into the flue. They attach directly to the Chimney Master Flex rods and are the best choice when cleaning from the bottom of the chimney. *8" brush if the inside diameter of the flue is 4" - 7" or for square flues between 5 X 5" to 7 x 7". *12" brush for diameters 7" - 10", square flues between 7 X 7" to 10 x 10" and rectangle flues between 5 X 9" to 8 x 12". *16" for diameters 10" - 14", square flues between 10 X 10" to 13 x 13" and rectangle flues between 8 X 12" to 11 x 15".